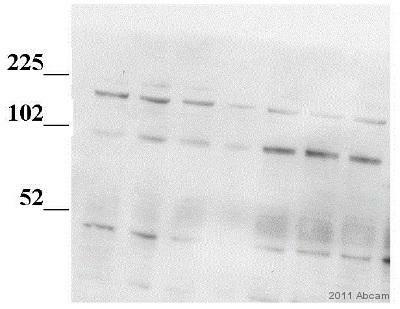 Synthetic peptide conjugated to KLH derived from within residues 50 - 150 of Human BMP4. 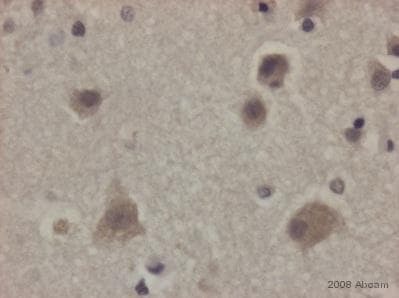 ab39973 gave a positive signal in the following Tissue Lysates: Brain (Human), Brain (Mouse), Liver (Human), Heart (Human) and Skeletal Muscle (Human). Our Abpromise guarantee covers the use of ab39973 in the following tested applications. 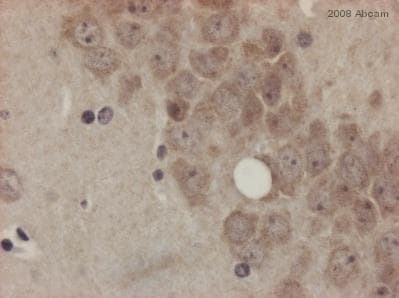 Immunohistochemistry (Formalin/PFA-fixed paraffin-embedded sections) - Anti-BMP4 antibody (ab39973)Image from Peyton, Charles C. et al. PLoS ONE 7.10 (2012): e47414. PMC. doi: 10.1371/journal.pone.0047414. Fig 7. Immunohistochemistry (Formalin/PFA-fixed paraffin-embedded sections) analysis of rat bladder tissue sections labeling BMP4 with ab39973 at 1/100 dilution. The tissue was fixed in 10% buffered formalin overnight, processed and embedded in paraffin. Serial 6 µm sagittal tissue sections were sliced along the cranial-caudal axis of the bladder. (u) urothelium; (lp) lamina propria. Additional bands at: 42 kDa. We are unsure as to the identity of these extra bands. 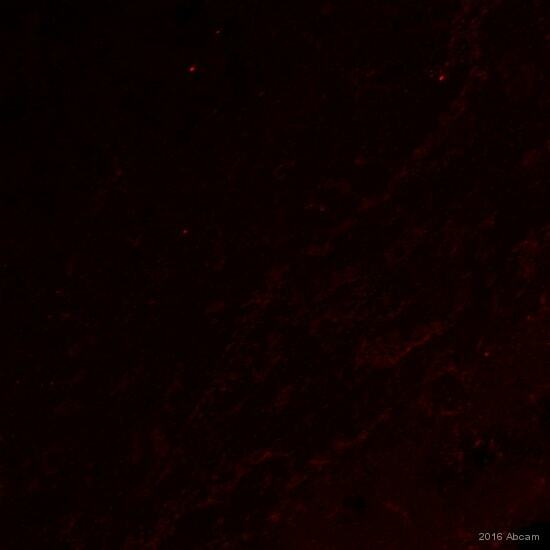 ICC/IF image of ab39973 staining primary hippocampal neurons. 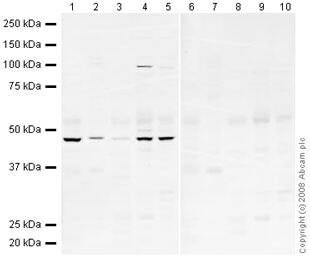 The cells were 4% PFA fixed (10 min) and then incubated in 1%BSA / 5% normal donkey serum / 0.3M glycine in 0.1% PBS-Tritonx100 for 1h to permeabilise the cells and block non-specific protein-protein interactions. 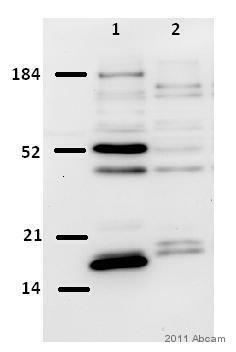 The cells were then incubated with the antibody (ab39973, 1µg/ml) overnight at +4°C. 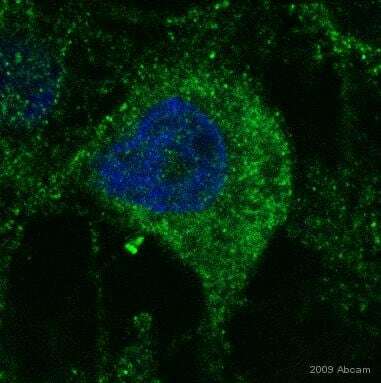 The secondary antibody (green) was Alexa Fluor® 488donkey anti-rabbit IgG (H+L) used at a 1/1000 dilution for 1h. DAPI was used to stain the cell nuclei (blue) at a concentration of 1.43µM. ab39973 detects a 47kDa band that we believe corresponds to the pre-cleaved form of BMP4 with the immunizing peptide raised against a region located in the propeptide. Abcam welcomes customer feedback and would appreciate any comments regarding this product and the data presented above.